Did The Thunderbird Nearly Kill The Chevrolet Corvette? The Chevrolet Corvette is usually seen as the quintessential American sports car of the 50s, and arguably of all time, but its rivals from Ford had industry experts thinking they had the more dominant product at the time in the way of the Thunderbird. As Bold Ride points out in a recent article, the Thunderbird, introduced in 1955, had sold 20,000 units in 1957, compared to 700 Corvettes sold during the time period. The Thunderbird was a bit different from the Corvette, with a larger 181.4 inch wheelbase and more upscale interior and exterior touches. Its luxurious touches have even prompted some to say its not a true muscle car, which is definitely up for debate. By the time the luxurious Thunderbird was introduced, the Corvette had already begun its transformation into a world class sports car. A V8 was offered in place of the Blue Flame inline-six, and while the Thunderbird and Corvette offered similar performance at the time, the Thunderbird could never shake its “personal luxury car” reputation. From 1957 onward, the Corvette stole the sports car spotlight. The second-generation Corvette boosted the popularity of the model, making it the legend it is today. The Thunderbird hasn’t caused quite the same stir, but there’s no doubt Ford had General Motors worried upon its introduction. The truth be told the Corvette has had some near death experiences over the years. One was not all that long ago as sales have been not to where they needed to be. This is why the effort that was put into the C7 was put into it. The wanted to double the sales and try to maintain them, Well they got the increase and we will see a host of things to keep it fresh. Some folks take for granted that the Vette gets a free pass but the truth is it gas to pass the same business case test as any other model and it has to make a profit. The 50s Corvettes and Thunderbirds are some of my favorite cars. My dad’s friend use to restore both with his dad, he was a GM guy and his dad a Ford. I tend to put the Ford vs GM aside with those two. The Thunderbird did mre to help save it than hurt it. GM produced 3460 Corvettes in 1954 and a third of them went unsold at year end. 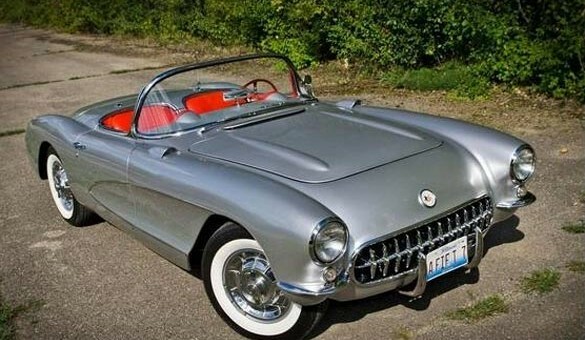 IT was so bad that on July 16, 1954 GM stopped production of the Corvette. There were two issues. The first was the abysmal quality of the 1953 1954 Corvette which was caused primarily by the lack of established assembly procedures and the poor fittinf firberglass body panels and the fact that it was assembeled with off the shelf parts from existing sedans. That turned dealers and potential customers off. The second issue was that Corvette could not deliver as a real sports car and that is something that it took Ed Cole and team of over 100 engineers to fix. Not until Daytona and Sebring were the Corvette’s perfromance credentials established. 181.4 inch wheelbase???? Was it a car or semi??? Maybe that was the stretch limo vette.